One fuschia suit from high school, never worn. That’s the only suit Vince Loran had when he retired from the Air Force on his 40th birthday. He was 18 when he joined as an aircraft electrician, a young father from the Bronx in need of direction and opportunity. After 21 years of service, everything and nothing had changed. 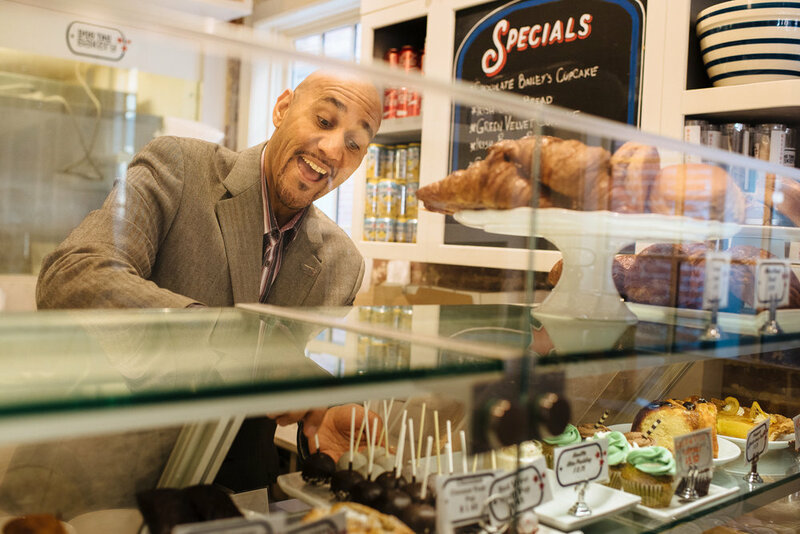 Vince bought a new suit, and got a new job, but for a year he had his sights set on Dog Tag—the small but mighty bakery on Grace Street that seeks to provide a transformative opportunity for veterans with disabilities by offering a business education at Georgetown University and real-life, in-store work experience. Late last year, Vince was on his way to Panama to connect with a leader he met during his fellowship at the United Way Worldwide when he got the call from Dog Tag. They had an opening. Now more than halfway through his five-month fellowship with nine other veterans, military spouses and caregivers, Vince is taking seven classes twice a week through Georgetown University to earn a certificate of business administration, and meets local business owners and alumni through learning labs. He spends the rest of his time rotating through the four major areas of the business: Branding and marketing, finance, and front- and back-of-the-store operations. By the end, Vince will know how to balance a budget and bake brownies. But for all the hands-on experience, it’s the emotional support that distinguishes the program from others. Founded by Father Curry, who has since passed, the non-profit encourages Dog Tag fellows to share their personal experiences with one another. With an average of 20 veteran suicides per day, according to the VA, Vince says the focus on shared introspection is therapeutic. Dog Tag seeks to share those stories, yet many don’t know the very story of the organization itself. Vince is hoping to change that. Vince is part of that mission, but he’s also on one of his own, with the hope of one day owning a business that increases youth ‘RPM’—respect toward others, purpose in life, and motivation toward humanity and the greater good. When he’ll get there, Vince isn’t quite sure. He just knows he has the direction, and—thanks to Dog Tag Inc.—opportunity.